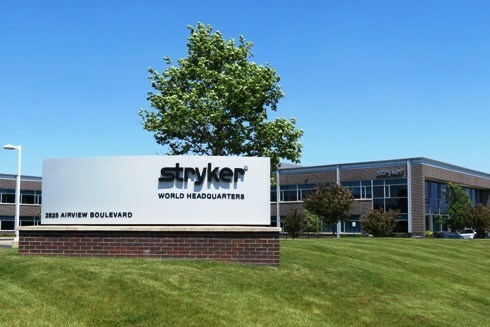 Stryker Corp. today announced that the U.S. Food and Drug Administration has granted pre-market approval (PMA) for the Surpass Streamline Flow Diverter to treat unruptured large and giant wide neck intracranial aneurysms. The device is the second flow diverting stent to gain FDA approval in the U.S. It is also approved and available in many markets around the world. Surpass Streamline is the first flow diverter indicated for large and giant posterior communicating artery aneurysms, while unruptured aneurysms are more challenging due to their location and surrounding anatomy. “Having Surpass approved for this and other locations is an important advantage for physicians and patients,” says Dr. Philip Meyers, professor of radiology and neurological surgery at New York Presbyterian/Columbia University Medical Center and co-principal investigator for the SCENT Investigational Device Exemption (IDE) trial which provided clinical outcomes to support Surpass PMA approval. Dr. Ricardo Hanel, director of the Baptist Neurological Institute at the Baptist Health System in Jacksonville, Fla., and co-principal Investigator for the SCENT IDE trial, says SCENT is one of the largest, prospective, multicenter clinical trials on flow diversion that is generalizable to real world outcomes. Mark Paul, president of Stryker’s Neurovascular division, says the PMA approval of Surpass Streamline Flow Diverter in the U.S. is an important milestone for the division, and it will expand the company’s commercial footprint into the flow diversion market.